Buenos Aires, the city of fair winds, is Argentina’s capital and a fascinating mix of Latin and European culture and history. Fair winds still come across the Rio de la Plata, but the city is very hot under the strong summer sun, and can be chilly in the winter. Spring is the favourite time of year for locals, called Porteños, because the city becomes a flourish of purple with the blooming jacaranda trees. You’ll need more than a weekend to get beyond a taste of this city, nicknamed BA by tourists and called Baires by Porteños. Casa Calma is located about a 20 minute walk from everything: the La Recoleta Cemetery, the Casa Rosada and Plaza de Mayo, the city’s oldest neighbourhood, San Telmo, the train to Tigre, and the ferry to Uruguay. Thanks to Buenos Aires’ traffic, a week-day drive by taxi or the city’s easy-to-use bus system takes about as much time as the walk. Casa Calma is a rare Argentine hotel that takes its wellness seriously — not only of its guests but of the environment too. Read more about Casa Calma here. Though it would be tempting to spend an entire weekend in your room enjoying your jacuzzi tub, in-room massage and a yoga class, the autonomous city of Buenos Aires is too tempting to leave unexplored. After you’ve checked in at Casa Calma, walk south and take a few blocks detour west to admire Buenos Aires’ spectacular Teatro Colón (Cerrito 628), the city’s main opera house. Refurbished in 2010, the current building opened in 1908, replacing the original dating to 1857. Teatro Colón is beautiful and is considered to have some of the best acoustics in the world. You can take a tour, but if you’re pressed for time, just walk around the outside and through the lobby. You want to get to Plaza de Mayo before everyone packs it in for the weekend. Weekdays at Plaza de Mayo are busier, with protesters knowing they’ll make more of a statement when the president is in office at Casa Rosada. Site of the 1810 revolution that led to Argentina’s independence, the square is ground zero for Argentine protests. Despite its violent history, the plaza is safe now (though watch your pockets in crowds). Don’t be alarmed by the riot barricades and police in black combat gear. Stroll through the plaza to get a good sense of Porteños’ and other Argentines’ sense of social justice. The western part of the square is where the active protests are, as well as people selling drinks, snacks and souvenirs. You’ll often hear protest speeches and even songs. Near the pyramid you’ll see pictures painted on the ground — the outlines of bodies, representing people “disappeared” during the Dirty War (roughly 1974-1983), and white head scarves, representing the Mothers of the Plaza de Mayo, the mothers of the disappeared who refused to be silenced and ignored. The Mothers and their supporters still protest on Thursday afternoons. At the eastern end of the plaza is the Casa Rosada, the pink house with the offices of Argentina’s president. Yes, it was on the big balcony that Eva (Evita) Perón made famous speeches and from which Madonna sang. In early 2016, tours of the building were closed, but check to see if they’ve re-opened again. Surrounding Plaza de Mayo are a number of gorgeous buildings; you can go inside the Cathedral for a look at its beautiful neo-Renaissance and neo-Baroque decorations. After all this touring, you might be hungry. Dinner in Buenos Aires is late (9 to 10 pm), so you likely want a snack. 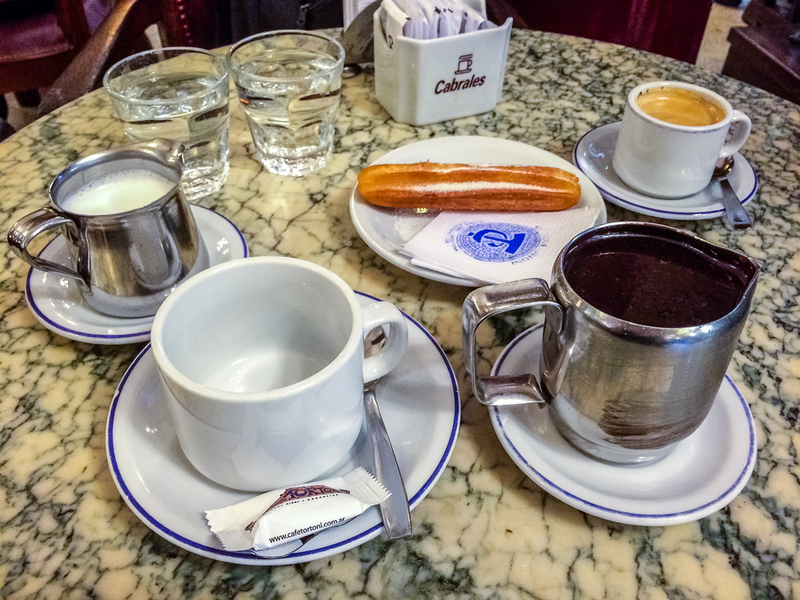 Pop in to Café Tortoni (825 Avenida de Mayo) for their famous melted chocolate and churros. Inaugurated in 1858, this café is considered one of the ten most beautiful in the world. It’s touristy, but worth it. If you only have one weekend in Buenos Aires, at least one dinner needs to be at a parrilla: a slow-cooked barbeque restaurant. While Argentine lomo (tenderloin) is famous, it can be a bit bland. Instead, try vacio (flank steak), ojo de bife (rib eye), or bife de chorizo (sirloin, not to be confused with plain chorizo, which is sausage). Argentines like their beef well done (many steak lovers would say seriously overcooked). A top restaurant where there’s lots of English will adapt, but in a more traditional restaurant order your steak “jugoso” (juicy) if you like medium and “azul” (blue) if you like rare. Despite Argentina’s reputation for quality beef, cheaper restaurants are no longer likely to have pasture-raised, grass-fed beef, and their cheaper cuts like vacio might be gristly and tough, though flavourful. El Mirasol (1032 Posadas) is known for some of the best barbeque in Buenos Aires and is just six blocks from Casa Calma. Other great steak choices are El Desnivel in San Telmo, and in Palermo, La Cabrera and Don Julio. A big breakfast is included in rates at Casa Calma, so no need to look elsewhere. You can even have it served in your room at no extra charge. Travel by foot today, or consider going by bicycle. Buenos Aires has a number of new bike lanes. You can get to major destinations easily by bike, but be aware that car drivers haven’t yet welcomed the addition and can be a little aggressive towards bikes. Biking on the weekend is easier as streets are much less crowded. You can borrow a Casa Calma bamboo bike for short jaunts, or rent one or take a biking tour with Urban Biking. Recoleta Cemetery is beautiful and can’t be missed on a trip to Buenos Aires. It’s open from 7 am to 5:45 pm. Early mornings are less busy, though the late afternoon light is gorgeous. Sure, follow the tour groups to Evita’s tomb. Your visit will be more memorable if you spend most of your time wandering throughout the cemetery’s other 4,690 vaults, imagining the lives of the people buried there, and of the living family members who keep the mausoleums immaculate or cobweb-covered. Try El Sanjuanino (Posadas 1515) for lunch, a short walk from the cemetery. Locals love it for tamales and empanadas accompanied, of course, by Malbec. For something a little healthier but still nearby, go to Fifi Almacen (Gorriti 4812) for organic and vegan food (takeout available too) or to Artemisia (Gorriti 5996). Today would also be a good day to stop in at some of Buenos Aires’ fantastic museums. The Museo Nacional de Bellas Artes is in Recoleta and features works by Rodin, Degas and Van Gogh, as well as Argentine artists. Admission is free, and Saturday hours are 9:30 am to 8:30 pm (closed Mondays). MALBA, the Latin American Art Museum of Buenos Aires, is another top draw with works by artists like Frida Kahlo, Bony Oscar and Barrenda Fabiana. Admission is 90 pesos, discounted 50% on Wednesdays (closed Tuesdays). You’ve seen Porteños walking around with thermoses and rounded cups with metal straws sticking out of them. They’re drinking maté, a type of tea. If you don’t have your own gear, it’s hard to drink maté authentically in the park like Porteños do. Instead, sample maté at a specialty café like La Cholita or Cumaná (Rodríguez Peña 1165 and 1163, in Recoleta). Pour almost-boiling water over a cup practically full of yerba maté leaves, and sip the drink through a bombilla, a metal straw. Just order one — it’s meant for sharing. Don’t stir the tea, and don’t thank your server (or your companions) for it until you’re finished and want no further water refills. The bitter caffeine-packed drink goes very well with pastries and dulche de leche. Casa Calma can prepare you a cup of maté too. Don’t forget to leave lots of time for strolling and admiring Buenos Aires’ beautiful architecture and outdoor art, like Floralis Genérica, a massive steel and aluminium flower which opens and closes with the sun. For a special dinner, take a cab to UCO in the Fierro Hotel in Palermo Hollywood (Soler 5862). Start with a cocktail in the beautiful garden, and then move on to dinner, staying outside or moving to the dining room depending on the weather. Everything at UCO is made in-house with the best local Argentine ingredients. Chef Edward Holloway’s kitchen is masterful and the dining room’s service spot-on. Selections change regularly, and you can order a tasting menu, à la carte, or sharing plates. Trust the combinations —the smoked trout and fennel salad were delicious on their own, but combined into one bite were out of this world. UCO’s knowledgeable sommelier will match your selection perfectly to one of their 325 wines. If you still have energy, your next stop should be tango, whether you’re up for dancing or just watching. Tango was prohibited for years due to its working class origins and because it was seen as too provocative and transgressive. It’s the soul of Buenos Aires. For a more local experience, go to a milonga — where local people gather to dance. Confiteria La Ideal (Suipacha 314) and El Arranque (Bartolome Mitre 1759) are close to Casa Calma. The Sunday market in San Telmo is a great place to buy local souvenirs like maté cups and bombilla, local leather products, handmade items and antiques (and, starting at 8 pm, you can watch tango in the Plaza Dorrego). Buenos Aires has plenty of street markets catering to different shopping preferences: head back to Recoleta for a market with both shopping and street shows, to Palermo for designer clothes, or to Mataderos for local food and performances by gauchos. San Telmo’s is the biggest and most famous. Sunday lunch should be at one of Buenos Aires’ Cafés Notables. The Buenos Aires government has identified 72 cafés and bars as having historical or cultural significance. Popular with locals, these cafés bring you back to an older time. Most (but not all) have great food and drinks, in addition to their atmospheric interiors. In San Telmo, both Bar El Federal (Perú & Carlos Calvo) and La Poesía (Chile 502) are recommended. San Telmo is a great place for graffiti. Seen as street art, not vandalism, Buenos Aires artists need only seek the permission of the property owner, and then can use doors, walls and whole buildings as their canvas. For socially active Porteños, graffiti is a way of making a social statement that lasts beyond the day’s protest in Plaza de Mayo. A Graffitimundo tour will take you to some of the best sites and give you the chance to meet local artists too. In addition to San Telmo, the best street art neighbourhoods are Palermo, La Boca and Colegiales, as well as in the subway. The inflation rate in Argentina is high, and has grown since the election of President Macri in October 2015. Expect prices to fluctuate. While still better than the official rate, the non-official “blue rate” currency exchange no longer provides as good a deal as in the past. Line-ups at official exchange kiosks are long, the hours short, and the process time-consuming (bring your passport). Especially when using one of the numerous money changers which call out to foreigners on the street, you risk receiving counterfeit bills in exchange for your US dollars or Euro. Instead, ask your hotel if they have a recommended place to exchange money. They’ll often send you to a local gold dealer or other legitimate operation, where you’ll have a speedy transaction, little risk of counterfeit, and a good rate. When preparing for your trip, remember that non-official currency exchanges take only US 50 and 100 dollar bills, not the smaller denominations that most people travel with. If you prefer to withdraw pesos from the ATM, note that fees in Argentina vary from $5 to $15 US on top of what your own bank will charge you. When speaking Spanish in Argentina, be aware of local differences in pronunciation. The most apparent is the standard Spanish “y” sound, represented by “y” or by a double “l”. In Argentina, “ll” is said like “sh” or “j”. So, for example, chicken (pollo) is not “poy-o”, but “po-show,” and a barbeque place (parrilla) is a “par-ee-jha.” The month of May in Plaza de Mayo is pronounced “ma-jho.” Porteños will understand you if you speak standard Spanish, but will be impressed if you use local pronunciations.